What Lighting Should You Buy for a Saltwater Aquarium vs Reef Aquarium? Lighting is one of the most important factors for your fish tank, and choosing the right lights, including type, brightness, and size, can have a significant impact on the overall health of your fish and the small ecosystem that is your aquarium. This is especially true if your tank has living coral, as this life form depends on light for its food and nutrition. So what lighting should you buy for a saltwater aquarium vs reef aquarium? We’d like to share some basic information to help you make the right choice. If you have a tank that holds only fish and artificial plants and decorations, then a standard light fixture will suit your needs just fine. Generally, you’ll want a lighting system that provides one to two watts for every gallon, which should provide enough light to simulate daytime conditions. In reality, a fish-only aquarium is very forgiving as far as the type of light you choose, as fish are not dependent on light to survive. Give them enough light so you can see them and you’ll essentially meet their needs. However, it’s generally accepted that you should avoid standard bulbs, as they can promote brown algae. Instead, choose fluorescent or LED lighting. What lighting should you buy for coral? That’s when the answer becomes more complex. When you add life that depends directly on light, which includes coral and plants, you need to be very particular about the light you provide. If you have a tank with coral, choose metal halide lights, LEDs, T-5 HO, VHO, or compact lights. Coral needs light for a large portion of its nutrition, but the required amounts will vary. You can find coral that grows near the surface, or coral that lives over 60 feet down, which means they are adapted to low-light conditions. The generally accepted ratio is four to eight watts for every gallon. However, if you choose coral that does better in low-light conditions, you can get by with low-powered light and still have a thriving aquarium. No matter what type of aquarium you have, it’s important to be aware of heat generation from lights. Products like metal halide lights can increase water temperature, so you may need to use fans or other methods to keep the water cool. You may even need a chiller, depending on the size of your aquarium and the specific setting. What Lighting Should You Buy for a Saltwater Aquarium vs Reef Aquarium? Get the Expert Answers You Need! Aquariums can be gorgeous, changing the character and charm of a room. However, they can also be complex. Work with Seatech, the area’s expert in aquarium design and maintenance, and you’ll have a saltwater aquarium that enhances your entire home with the right lighting for fish, plants, and coral. This entry was posted in Aquarium Maintenance, Reef Aquariums, Saltwater Aquariums and tagged Aquarium Lighting, Reef Aquarium, Saltwater Aquarium on June 26, 2017 by admin. Want to have a clean, clear, vibrant aquarium? 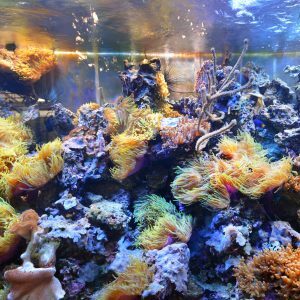 The secret to a thriving aquarium is meticulous care and attention to detail, but there are a few tricks you can use to create a tank that looks dazzling and provides a healthy environment for your favorite species. In the wild, your fish enjoy a virtually unlimited supply of new water. There are currents that push out contaminants (both natural and otherwise) and bring in a fresh supply. In the tank, however, the water basically sits still; it’s up to you to be the current! Regularly change a portion of your water and you’ll be able to keep fish healthy. How much should you change? That depends on who you ask. Some sources recommend changing 25% of the water every month, while others say you should replace 10% to 15% of the water every two weeks. There are even recommendations for changing 50% of the water every week, but if you stick to 25% every month, your fish will be in good shape. People don’t like to be crowded, and neither do fish. Be sure to keep the population in your tank low so fish have plenty of room to roam. One of the most common rules is one inch of fish (front to tail length) for every gallon in the tank. But fish are not all shaped the same; some are slender while others are plump. While the one-inch rule works well in principle, you can also make estimates based on the overall volume of your tank. But one rule always holds: it’s best to have too few fish than too many. The light in your aquarium, for the most part, is for you to view the fish and not for the fish themselves. To keep the tank thriving, it’s best to keep the lights on for 12 hours or less a day. Light can support algae growth, so the less you use, the less algae you will have. Keeping the lights to a minimum is one of the secrets to a thriving aquarium. We always hear about the health benefits of trees and plants, and the same principles apply to underwater vegetation. Plants provide filtration, protection, and can even help prevent algae growth. Another potential advantage is food, as many fish (but certainly not all) will eat pieces of plants, giving them a healthy food alternative and a more diverse diet. You can have world-class professionals design, install, and maintain your aquarium. Contact us today and we’ll make sure you have everything required for one of the most impressive aquariums possible! 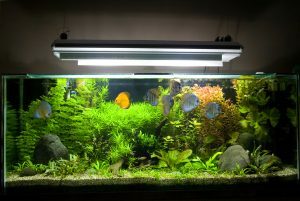 This entry was posted in Aquarium Maintenance and tagged Aquarium Maintenance, Aquarium Water, Aquarium Water Quality on June 20, 2017 by admin.